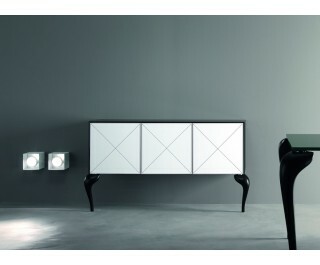 Multifunctional cabinets in white or black lacquered crystal with melamine structure in the same color of the crystal. Stradivari cabinets are available in five different dimensions, they have two legs and are prepared for wall mounting. Legs are in white or black lacquered solid wood. Two optional wooden legs are always furnished in case the cabinet wall mounting is not possible. Two trestles are furnished to allow to the customer an easier assemblage.